In Berlin last month I began a dialogue with Grit Herrnberger, co-author of Bridging Diversity – An Early Childhood Curriculum. The book takes a holistic view of learning and puts forward a curriculum aiming to develop four competencies: ego, social, knowledge and learning method competencies. During my conversations with Grit, she described learning as walking in the snow. 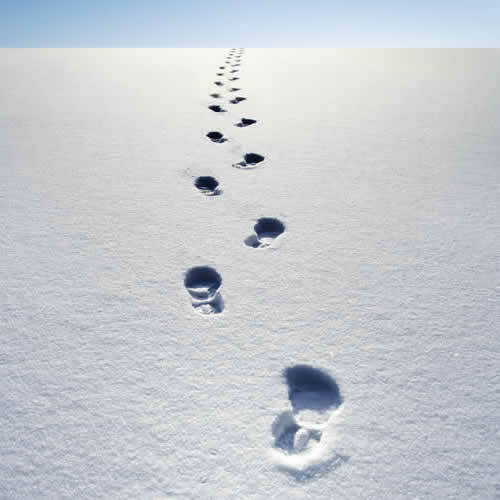 The first time we encounter new information it’s like walking in the snow – an untrodden path in which we leave footprints. Unless we revisit the path again and again, however, the footprints will soon disappear. By revisiting, we form a well-trodden path, a highway that becomes more permanent and easier to navigate. This relates back to an earlier post which identifies review as something I expect from a teacher. Grit also described how if, in the early stages of walking in the snow, we connect our learning with emotion, movement or social activity, it creates deeper, longer-lasting footprints. As sceptical as I (currently) am about Total Physical Response as a method, I wonder if there are parallels to be drawn here. I do agree from experience that if an activity is relevant and meaningful for learners, then it is not only more engaging but also more effective.